We started giving out electronic copies of What's up with Catalonia? to tourists at Gaudí's spectacular Sagrada Família tourist magnet on Thursday. It's harder than it sounds. First, you have to get up the nerve to speak to total strangers when the only thing they've heard about people from Barcelona is that we're all pickpockets. We started at the line of people waiting to go in. "Hi, do you speak English?" I tried. Yes, said an older couple. 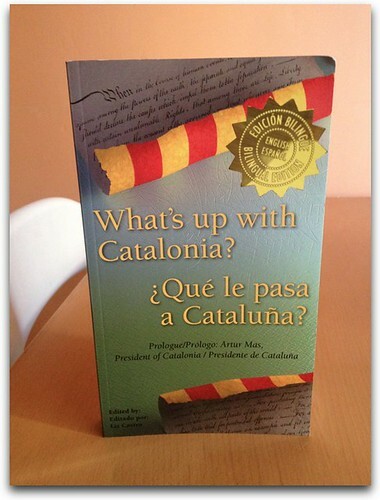 "I've edited a book of essays about Catalan politics," I said, as I showed them the "What's up Card". "No, we're not interested." Oh dear. My second try was similarly unsuccessful. "Catalan politics" was definitely not the right way to go about it. My third try was with three women with dredlocks and noserings. I noted an Irish accent. "Hey, do you speak English?" I ventured. They nodded. 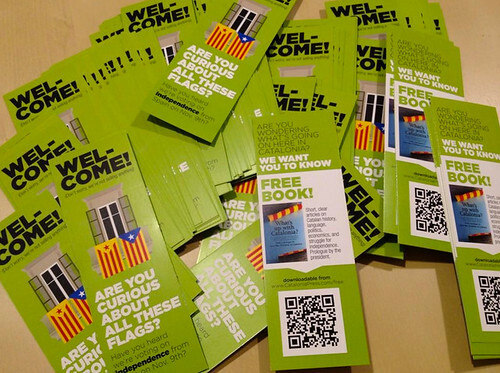 "We're giving away a book about the Catalan independence process," and I handed her a card. "Oh, you mean like Scotland?" Now, I was getting somewhere. From there it got steadily easier, and more fun. I got braver, and instead of trying to guess nationalities, I talked to everyone. I explained that we were offering a free copy of the book, pointed up at the Catalan independence flags hanging from balconies on the street, and explained that Catalans just want their voices heard. "I'm curious," a Dutch woman told me, taking the card. "Thanks." "You used to be part of Spain too," I told her. Her friend laughed. An older Danish woman warned against violence. I promised her that Catalans are determined to win back their country peacefully, by voting. Another couple lost no time, telling me pointedly, "We're not interested." I saw a German couple talking and pointing at the card for several minutes after I left them. An Ethiopian man told me he lived in Barcelona but didn't know very much about the process. "But they should be able to vote, right?" he told me. A young couple with English accents said, "you mean like the Scottish? ", and somehow it didn't sound quite as positive. I asked them where they were from. Birmingham. What do you think about the Scottish referendum?" I asked. "They can do whatever they want," the man answered with an annoyed expression. I congratulated them on their democracy, and explained that in Spain, Catalans are not allowed to vote on their own future. When I got home that afternoon, I saw that people had already started to download the book: the first from Cambridge (not sure if it was Massachusetts or England), Seville, Atlanta, GA, Madrid, and Belgium. If you'd like to share Catalonia's story, feel free to come down to the ANC who are helping me distribute the cards (Marina, 315 in Barcelona), print out the cards yourself, or just send the link around. Thanks! Let's give tourists info on Catalonia to take away! Summer in Barcelona is high-tourist season. Everywhere you look there's someone checking a map, standing in line to see a Gaudí building, nursing a sunburn, or buying an ice cream. While lots of locals are fed up—especially with the drunk ones that sing loudly into the night or run naked through the streets—I look at tourists as potential distributors abroad of information about the Catalan independence process. Every time I get on a metro or have a coffee in my plaça and overhear another language close by, I wish I had some way of telling them, "Hey, there's more here than meets the eye. These people want to get their country back. They want to be independent again and decide their own destiny. They want to do it peacefully and they want to vote on November 9th. And a couple million people are going to create a huge V in the middle of Barcelona to demand their right to vote, and HERE'S WHY." But it's hard, and sometimes exhausting, starting conversations with perfect strangers. But how about giving them all copies of the book I edited last year, What's up with Catalonia? with articles written by top-notch academics, economists, writers, educators, and politicians including Catalan President Artur Mas, ERC President Oriol Junqueras, ANC President Carme Forcadell, and many more. I can't hand out print books but in this day of electronic copies, I can sure give them electronic ones. And what if I could get lots of people to help me? I'm surely not the only person who comes into contact with people from other countries EVERY SINGLE DAY. Imagine if everyone in Catalonia had a handful of cards in their purse or backpocket so they could hand them out as they explain how to get to the Casa Batlló or the most visited museum in Catalonia, the home of FC Barcelona. 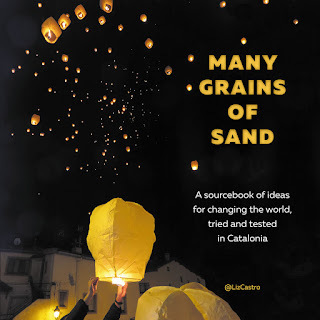 Wouldn't it be brilliant if tourists took Catalonia's story back home with them? You can help. Either pick up a bunch of What's up Bookmarks (lovingly designed by Jordi Calvís) at the ANC headquarters on Marina, 315, or contact me directly and I'll get you some. Or download the PDF file yourself and print some out (and let me know so I can keep track). And you can always just share the link. As I've said many times before, Catalans are not waiting for people from other countries to come help or save us, we just want them to be watching the whole process. When we declare independence, we don't want it to be a surprise to anyone. Starting on January 2, 2014, at 17:00 CET (11am EST, 8am PST), I will be interviewing prominent Catalan activists, politicians, writers, academics, artists, and scientists in a unique new format: on Twitter, live, and in English. It seems to me that the best way to find out just what is going on in Catalonia is to ask directly. Twitter will allow us to share the interview in real time, and invite questions and comments. We'll use the hashtag #CatalanTalk. If you can't follow the interviews live, don't worry. I'll offer a recap later on this blog and eventually in book format. Details to follow! Thanks to Porter Anderson for the inspiration. His interviews of people in publishing on #PorterMeets, Mondays at 5pm EST are really great. 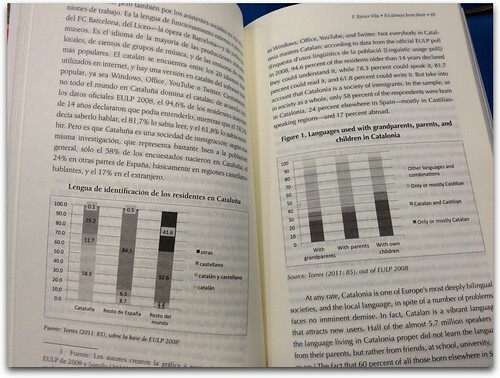 Sant Jordi, Lost Luggage, and What's up with Catalonia? Yesterday, April 21st, the Catalan Institute of America invited me to present What's up with Catalonia? at their annual Sant Jordi/Books & Roses celebration at the 86th Street Barnes & Noble in New York City. The event, which is one of the New York-based Catalan group's major get togethers of the year, together with September 11th, was very well attended, with every seat in the house filled, as well as a fair number sitting in the back. Probably about 200 people in all. The celebration began with a lovely puppet show for the kids. The hall was then lined with chairs and novelist Jordi Puntí and Mary Ann Newman took the stage to present the new English edition of Jordi's book, Maletes Perdudes [Lost Luggage]. Jordi and Mary Ann took turns reading passages of the book, Jordi in Catalan and Mary Ann in English, and it was both interesting to listen to the story itself, and the curious tale of four brothers whose names were a “sort of Latin declension” of Christopher, as well as listening to the translation and mentally comparing it with the original. Thoroughly enjoyable. After a short intermission, with delicious chocolates donated from a famous Barcelonian chocolatier, Oriol Balaguer, next up were Laia Balcells, Assistant Professor at Duke University, Jordi Puntí, and myself, with columnist and political scientist Jordi Graupera expertly moderating a panel discussion on What's up with Catalonia? Laia explained how we got where we are, I talked about why and how the book came about, and Jordi gave us a Barcelona-based view of the September 11th demonstration and current atmosphere in the city. There were a lot of good questions and comments from the audience. Perhaps the most emotional moment came when an older woman stood up and explained that, born in 1933, she had lived through the Franco years and she was determined to live long enough to see Catalonia's independence. Laia Balcells will talk about What's up with Catalonia? and the Catalan independence process in general on Tuesday with Clara Ponsatí at Georgetown University, while I will be speaking with a group of Harvard University students on Tuesday, and a UMass Amherst group on Wednesday. Please join us at any of those events if you're close by! Many thanks to all who helped organize these events! Labels: Jordi Graupera, Jordi Puntí, Laia Balcells, Mary Ann Newman, What's up with Catalonia?